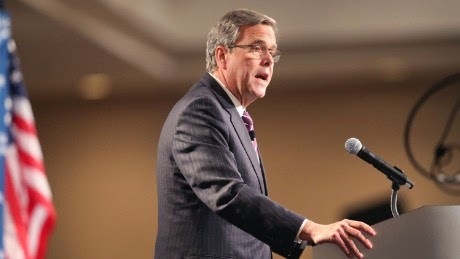 TALLAHASSEE—Jeb Bush, former Florida Governor and possible frontrunner for the 2016 Republican presidential nomination, announced today during a speech to the Florida Chamber of Commerce that he has filed paperwork legally changing his name to Jeb Smith. "I think everyone would agree we've had too many Bushes and Clintons in the White House," said Smith. "The country needs something different." "We've never had a President Smith," said Smith's campaign manager, David Kochel. "Look it up. You'd think we would have, because it's such a common name, but we haven't. It's time to change that." Political analysts say Smith's name change could be a preemptive strike against Democratic frontrunner Hillary Clinton, who inside sources claim has contemplated changing her name to Jane Smith. "Now Hillary's going to have to pick something else," said Fox News analyst Charles Krauthammer, "like Jane Miller." "If I was Hillary I'd go with Jane Jones," said Rachel Maddow of MSNBC. "The alliteration will play well with younger voters."